For the first time since Russell Westbrook’s rookie season, the Oklahoma City have stumbled out of the gate. Currently sitting at 5-13 and 3rd place in the Northwest Division, the Thunder have much reason for optimism; their sights are set on an NBA championship this season. Why would a team with such a poor record have such a lofty goal? Having two of the league’s most talented players in reigning MVP Kevin Durant and the aforementioned Westbrook certainly helps. Unfortunately for OKC, both stars have missed the majority of this young season. Westbrook did not make his debut until last week versus the Knicks, while Durant played his first minutes in Tuesday’s loss in the Big Easy. It may already be a month into the season, but then again, it is ONLY a month into the season. The Thunder have plenty of time to get their act together and will climb their way atop the Western Conference standings at ease. As usual, the conference is stacked with contenders such as Memphis, Houston, San Antonio, and Portland, but among those clubs, only the Spurs have more playoff experience than this young Thunder team. “We’ve got a great locker room, we’ve got a great team, we’ve got a great group of guys. 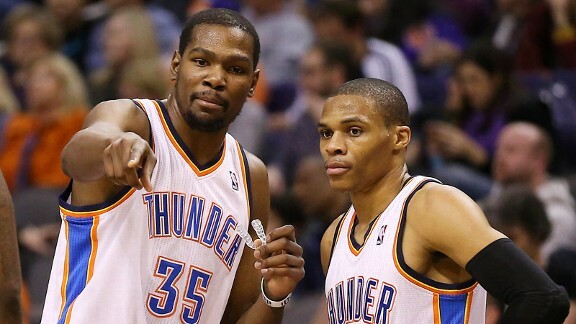 No doubt,” Durant said. “We’ve really got to put on our hard hat every game and grind ’em out, (via Royce Young, NBA writer for ESPN.com). Westbrook added onto Durant’s optimistic attitude, understanding the reality of where the Thunder current stand in relation to the remaining length of the season. “How many games we got left? Sixty-something?” Westbrook said. “How many games we out of eighth place? Five, six? Not worried” (via Royce Young). A tough start and a bad stroke of luck has doomed the Thunder to start their seventh season in the Sooner State. But backed by the leadership of its star players, the team appears to be in good hands. Larger goals lie ahead as they aim to win their first championship since their Seattle days, while a healthy starting lineup will attempt to reestablish the chemistry they’ve flawlessly executed throughout the past several years. Lil Wayne once featured in his song “Kobe Bryant” that no one was starving for a world championship more than Kobe. Today, that title now falls on Kevin Durant. In Oklahoma City, it’s finally #ThunderUp time again.